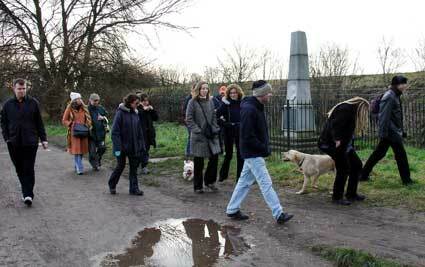 It was a bit of a gamble organising a walk in the depths of Winter, but the weather held up and a hardy crew of seventeen folks turned up for a beautiful stroll along the south and north banks of the River Thames. 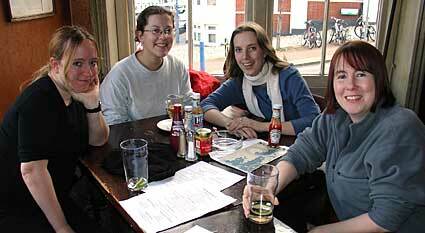 The walk started at Putney in south London, a bustling suburb of London easily accessible by the tube (Putney Bridge/East Putney) and BR (Putney station). Although now swallowed up by the great metropolis of London, Putney was once a Roman settlement, surrounded by countryside. The first written reference to Putney is found in the Domesday book in 1086, which records that its ferry yielded twenty shillings a year to the Lord of the Manor. The Domesday book lists the town as 'Putelei', which is commonly assumed to be a transcriber's error for Puttenhuth - the form usually found in earlier documents. 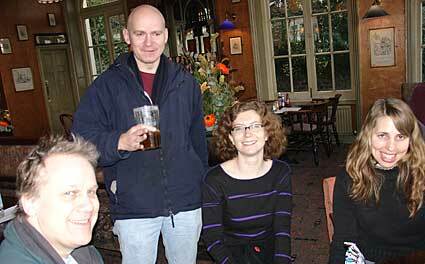 The meet up point was the Duke's Head pub on Lower Richmond Road, Putney. Outside the pub is the starting point for the University Boat Race, an annual race between the rowing crews of Oxford and Cambridge, two of the oldest and most prestigious universities in the world. The annual race began in 1829 and attracts huge crowds all along its 4.25 mile route - we'd be walking most of the route today (and back again!). 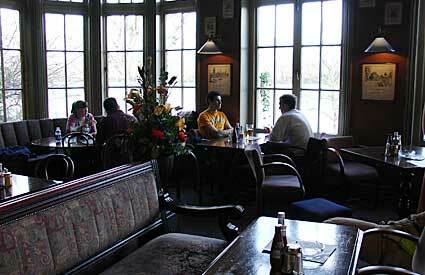 The pub has enjoyed a long connection with rowing and used to let out one of its cellars as a boathouse to a local rowing club. There's been a pub on this site since the early 19th. century. The current three-storey Victorian building was rebuilt in 1864, completely refurbished in 1894 and served as a hotel for travellers by road and by river for many years. The interior of the pub retains its lavish Victorian splendour, with etched and embossed glass, large flamboyant mirrors and richly carved mahogany. There's three bars inside; the public bar at the front, saloon in the middle and a spacious, high roofed dining room at the rear, overlooking the river. It's a fabulous, welcoming old-fashioned boozer and it was mighty tempting to spend the entire afternoon slowly getting drunk in such a lovely location! Putney Bridge links Putney on the south bank and Fulham on the north bank of the Thames. There was a strategic temporary bridge built over the Thames at Putney in 1642 during the Civil War, but the first 'proper' bridge was a wooden structure put up in 1729. This was the first bridge to be built between Kingston and London Bridge, and investors made a fortune from the toll charges: "Coachs pulled by 6 or more horses paid 2 shillings. Horses laden or unladen paid two pence Foot passengers paid one half penny on week days and a penny on Sundays." In 1886, the bridge was replaced by the present solid Cornish granite structure and later widened in the 1930's by Bazalgette. Heading west from Putney, there's a (slightly muddy) footpath that hugs the southern curves of the river. 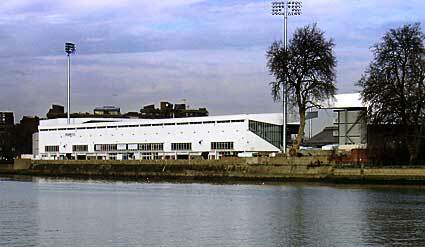 On the opposite bank you can see Fulham Football Club's stadium, named after the 1780 Craven Cottage, which burnt down in 1888. The ground incorporates a half timbered cottage built by Archibald Leitch (around 1905) which originally housed the dressing rooms and club board room. The club has had mixed fortunes over the years, with the glory years of the late 50s/60s painfully contrasting with their bleak days in football's basement in 1994. By January 1996, memories of the 30,000 crowds of the 60s were long gone, with the team languishing near the bottom of Division Four and home gates averaging a meagre 4,000 souls. Happily for the club, an enormous cash injection from Harrods boss Al Fayed propelled them back to the top flight of football where they (just) remain today. 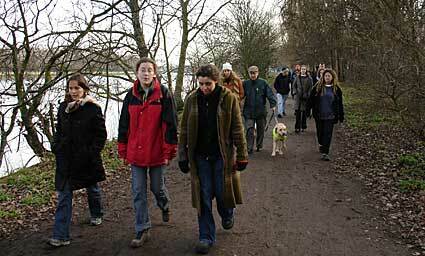 The walk club crew stomp their way along the Thames-side path. For most of the route, the path feels very rural, and it's easy to forget you're in the middle of one of the biggest cities in the world! The guide dog, Russ, got very excited by our river side trample and hurtled around at high speed once his lead was taken off! This stretch of the river is very popular with rowers, and a steady procession of large and small boats paddled by. In this scene, you can see a fella in a silver powerboat blasting out verbal encouragement to rowers through a megaphone. Trying to assemble the gathered walkers to give out some of my carefully-researched info was a bit like herding cats, but I managed to get their attention for long enough to tell them a little about the Steve Fairbairn memorial. 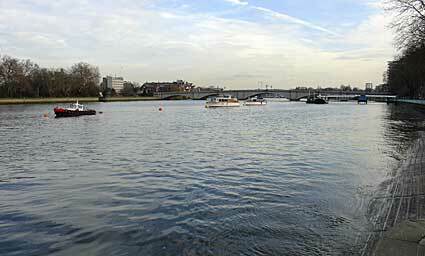 This is a processional race for eights rowed over the 4.25 mile championship course from Mortlake to Putney (i.e. the Oxford-Cambridge Boat Race course in reverse). It involves a maximum of 420 crews and involves some 3,750 competitors, believed to be a record number for a single continuous rowing event. The Race is usually held on the third or fourth Saturday in March each year (depending on tides and the date of the Boat Race). It usually takes place on a different day to the Boat Race, although in 1987 and 1994, the Boat Race took place in the morning and the HORR in afternoon. Situated near Hammersmith Bridge, the faience-fronted warehouse which has now been converted into 250 posh homes for the well heeled. 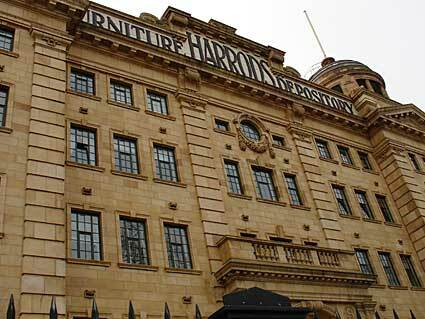 Built in 1894, the striking orange and red Harrods Furniture Depository retains many original features, including the distinctive terracotta tiles advertising its name. 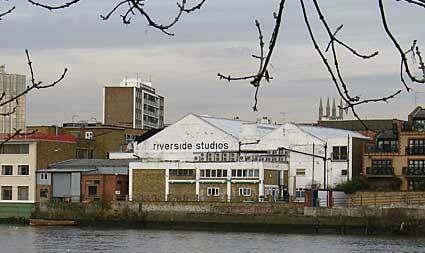 Starting life as an industrial building in the 1800s, Riverside Studios has enjoyed a long tradition of drama, film and television production. The premises were bought by the Triumph Film Company in 1933 who transformed the engineering works into two large film studios, producing hugely popular films like 'The Seventh Veil' (1946) which filled cinemas continuously for 10 years. The studios were bought up by the BBC in 1954, with classics such as Quatermass II, Dr Who, Dixon of Dock Green and Z cars being shot at the studios. The Riverside has also enjoyed a close association with music, with shows such as The Six-Five Special, the Old Grey Whistle Test and Top of the Pops being produced at the facility. It now serves as a popular arts and media centre, hosting contemporary cinema and theatre. 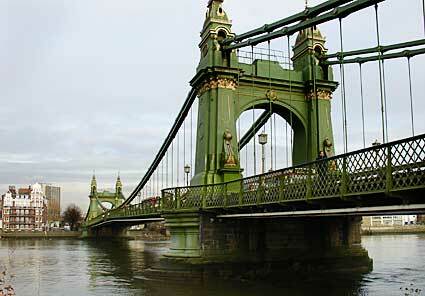 Sporting a span of 422 feet, this ornate Suspension Bridge was built by Sir Joseph Bazalgette (1818-1891) in 1887. It replaced the earlier suspension bridge built by William Tierney Clarke in 1827 (at a cost of £85,000), which has the honour of being the first suspension bridge built in London. Although highly decorative, the bridge isn't particularly strong and in 1984 an overloaded HGV lorry managed to wreak considerable damage to the 100-year-old structure as it rumbled over. In 1992 a weight limit was placed on the bridge, with all heavy vehicles and double decker buses banned. The weakness of the bridge proved to be an irresistible draw to Irish nationalist bombers who targeted the fragile structure no less than three times! In 1939, Maurice Childs threw a suitcase containing a bomb from the bridge, in 2000 a small bomb caused some damage to a supporting girder and on April 24 1996, 32lb of Semtex - the biggest bomb of its kind ever planted on the mainland - failed to explode on the Bridge.